I am touching the magical packaging of these four grievances, which is manifested in purple, inked cloth, and two buttons, one with the symbol of Tapemancy records, and the other, I believe, with the sigil of Zavier Krall. I am sitting with a friend of mine in the small entrance hall in my house, which is slowly crumbling down. We both have a cup of tea and I slowly unfold the purple cloth. Behind my friend is my old, blue cupboard, which holds no cups, but the skulls of cats, birds and one goat. I love all animals with all my heart, and would never hurt one, but I like to keep skulls I find in the wild, as there is something beautiful in death, only a little less than the beauty of life. Killing is where there is no killing, only grievance. I am now holding the cassette by Zavier Kral, who may be known as Troy Schafer from numerous musical acts such as wreathes, Kinit her, Raindrinkers and more. Freed from its purple cloth cover, I now see the black painting over the white paper on this cassette, describing several symbols held together into a symmetrical composition that brings to mind a story about the beast gods of the ancient Egyptians and contemporary rulers. 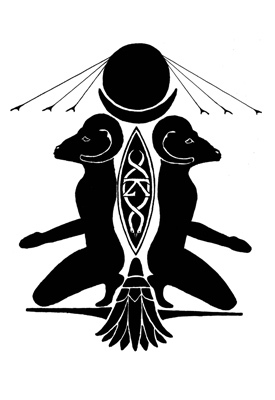 Two figures kneel on the cover, having goat heads on top of human body. I don’t remember any Egyptian god with a the head of a goat, but this doesn’t seem to interfere with the symbolism I bestow on this pretty painting, done by the very interesting artist Dani Dahlke. I talk with my friend as I take the cassette out of the plastic box, and then I leave the room in order to get us more green tea. When I enter the room again, my friend have already put the cassette in my tape player, and the chanting of Zavier Krall welcome me back to the table. We notice the storming strings, shrieking violently together, and feeling the room with the aroma of self meditation. I was going to continue our conversation, but now my mind is drawn into distant places as Krall ring heavy bells and whispers low, heavy whispers. The air sinks to the floor and the cold of the winter seems to pause for a while. I am afraid I might be considered as a boring host, as I sink into my own psyche with the help of the punishing crushes heard from my speakers, but I take comfort in seeing my friend is in the same place. Titus, one of my cats, is now on the table, checking my tea and the purple cloth. He is now forcing his head on my body as I am staring blankly into my reflection on the cupboard’s glass door, appreciating how my reflection merges with the skull of the goat. There are four grievances in this album, and I am not sure where one ends and another begins. The harshness of the sounds, balanced perfectly with dynamics and sense, is driving deep exoplasmatic needles into my (our!) brain, and makes me notice only the tiniest vibrations in Krall’s stellar overdrives. My friend and I share this four parts ceremony together, and sit almost ignorant to how my speakers are shuddering under the encumbrance laid by Krall. Titus appreciates it as he sleeps on one of them. The second side of the cassette begins with a booming thunder, sending forth infinite comets of different sounds. My friend tells me he finds it beautiful to trace each of these sounds, of these comets, and hear where exactly they are heading, how they appear and how they die. The album is over. The 4 grievances are done with. I pour us some more tea, as I watch a spider standing on the wall to my left. My friend then presses play one more time. He brings a paper and a pencil and starts drawing. Grievance might be an unfortunate state, but it also serve as a powerful catalyst.